We understand the importance of keeping your property safe and secure. One of the best ways to maintain a level of control for the entry of your property whether it be your office or other facilities is an access control system. 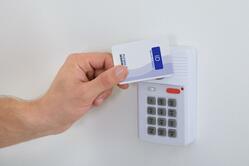 In addition to a security system, access control provides a second layer of security. Many access control systems feature multiple user codes, built-in cameras, audio communications, and biometrics. Integrating an access control system with an automation system can also allow you to remotely open and close doors, gates and other points of ingress or egress.